Okay, my husband, Eric, and I are very into music and that meant we were getting the band of our dreams for our wedding. The only problem? They cost 30% of our whole wedding budget. We didn’t care. That was the single most important thing for us to have at our wedding. That meant a heck of a lot of skimping everywhere else. And it’s a wedding, so that meant skimping without looking like total crap. Invitations are incredibly costly. I get it. They’re doing some very amazing things very professionally. It’s just not something I was willing to afford. So I made my own. Our theme was a sort of neo-Victorian masquerade, so handmade Valentine-style cards actually fit in very well. There’s no reason you couldn’t do something yourself, even if you want a more perfect look than this. The paper is mulberry and I got enough of it (on eBay) to do my invitations, my response cards, my place cards and my dance cards. Unless you live somewhere with a lot of inexpensive paper stores or you know how to make the kind of paper you want, eBay is going to be your best bet. The stencil is from Michael’s. 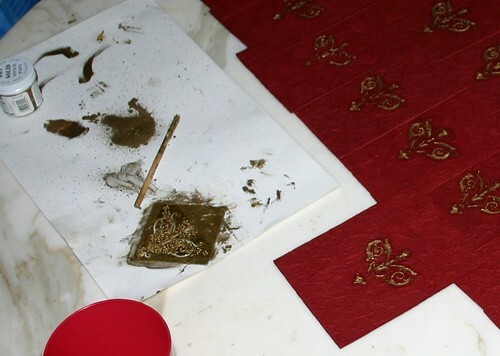 I wanted a brass stencil because of the metallic paint I was using. I threaded ribbon through two punched holes on the side and tied them in a bow to attach the eggshell-colored paper I used on the inside. Same basic deal for the response cards. I chose quarter size to save on stamp costs. My envelopes came from envelopemall.com, a total lifesaver. For my thank you notes and guestbook pages, I actually chose origami paper. The origami guestbook concept is actually something I saw on Martha Stewart’s site and really liked. After all is said and done, it cost me less than $100 for envelopes, stamps, invitations, response cards, thank you notes, dance cards, place cards and guestbook supplies. Entry filed under: not spending. Tags: cutting costs, event sites, invitations, weddings. ahh, I really like this idea. This is like screen painting but the difference is that I can do it by hand. By the way I would like to share that that idea would also be good on DVD too. Try it. I got it from Silver Screen Invites.